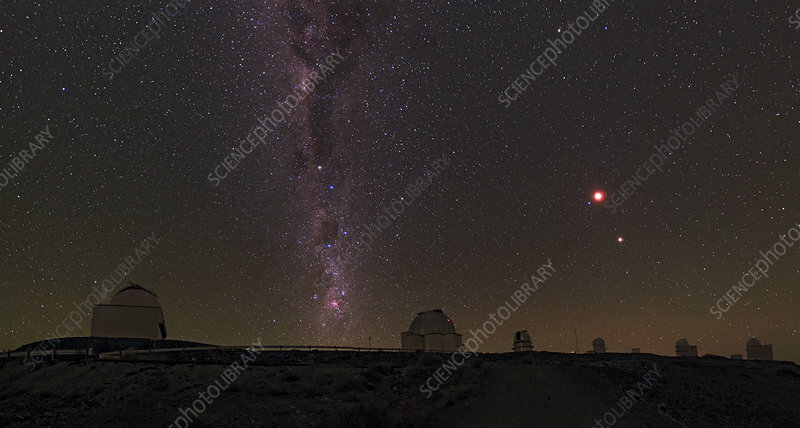 Milky Way and total lunar eclipse above La Silla Observatory in the Atacama Desert, Chile. The red eclipsed moon is next to bright blue-white star Spica in Virgo, and the red planet Mars, shining at its brightest, appears below the moon. Along the Milky Way, working upwards, are the Carina Nebula, the Southern Cross, bright stars Alpha and Beta Centauri, and the bright galactic central bulge in the constellations Sagittarius and Scorpius. A lunar eclipse occurs as the Moon passes into the Earth's shadow. Lunar eclipses occur only at full Moon, and then only when the Earth and Moon are correctly aligned (about 2-3 times a year). Photographed on 15th April 2014.